Inspired by the pages of Fearless Food, a cookbook by author and cookery school owner Lynda Booth. This humble pie brings together a few of my favourite things: vegetables, hummus and crumble. 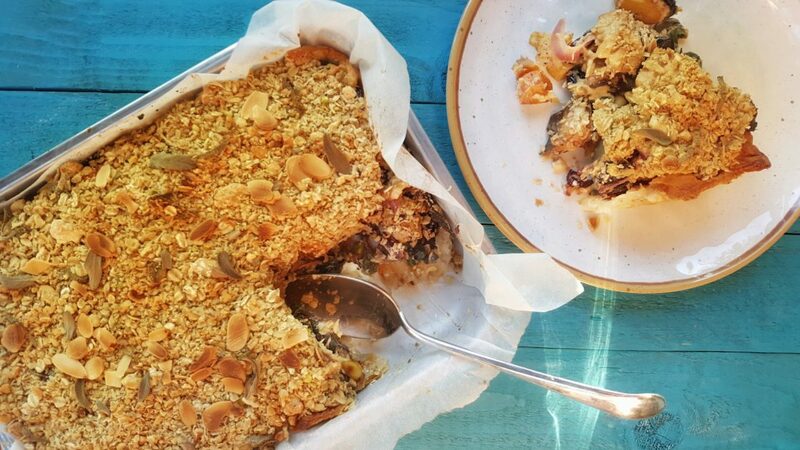 The crumble topping isn’t sweet but savoury with nuts, herbs and cheese. This pie can be made with or without the pastry bottom. Store bought hummus will work fine. However, making your own hummus is really easy I promise and allows you to explore different flavours so why not give it a go with one of my favourite hummus recipes! Any root vegetables can be used in this crumble pie too. Melt two teaspoons of coconut oil in a roasting tin. Once melted mix through the spices, salt and cubed sweet potato and turnip. In another roasting tin, mix the tamari and aubergine together. Place both roasting tins in the oven. Roast the vegetables for 15 minutes or until tender. Melt 1 teaspoon of coconut oil in a large frying pan or saucepan over a medium heat. Add the onions and saute until translucent. Add the garlic, ginger, pistachios and hazelnuts stirring regularly. Once the nuts begin to brown, add the cranberries, honey and spinach. Toss until the spinach wilts. Remove from the heat and mix through the roasted vegetables. Make the hummus as per recipe. For the savoury crumble topping: place the oats in a food processor or use a handheld blender. Blitz until a breadcrumb appearance is formed. Add the nuts and blitz until slightly crushed. Place the blitzed oats and nuts in a mixing bowl with the remaining ingredients. Stir until well combined. Line the base and sides of a lasagne dish with the puff pastry. Place half the vegetable mix on the base. Spread half the hummus over the vegetables. Add the remainder of the vegetables on top followed the hummus. Sprinkle over the crumble topping and the flaked almonds.